Peer Review vs. Scholarly: Do you know the difference? As Sarah began to write her Literature Review for her dissertation, she recalled what her mentor offered as an expectation for including her sources. The goal was to have 85% of the 60 or so resources used in her Literature Review to be (a) peer-reviewed and (b) within 3 to 5 years of graduation. Sarah wasn’t quite sure regarding the difference between a scholarly source and a peer-reviewed source. She began to dial the phone to confer with her mentor . . .
Has this scenario happened to either you or your students? Perhaps I can offer the needed clarity. There is indeed a difference between what is meant by peer review and scholarly. For example, I, as a doctoral scholar, have 22 publications to my name–not all of them are peer-reviewed however. The purpose of using peer review confers expertise and specialization within a particular industry to ensure veracity and accuracy of information prior to publication. Think of peer review in the Astronomy World, where confirmation includes eight planets, not the previous nine. Pluto did not fall from the sky; however industry experts updated the classification of planets, where Pluto was no longer in the club. Experts on staff with journal publications in the world of astronomy would review all information prior to publication to ensure veracity and accuracy that all articles would reference eight, instead of nine planets in all future publications. Think of peer review as simply a double check by those experts in the know prior to publishing. A scholar however doesn’t necessarily have to have a book peer-reviewed prior to publication. (Do not confuse editing, with peer-review). For example, many universities struggle with using any course textbook or simply a book as part of dissertation writing. Why? The reason is simply to ensure the veracity of information. Peer review offers an additional layer of confirmation of the information presented with the writing by experts in the industry or field. While a university professor may publish a book on the topic; a book is not usually peer-reviewed. Perhaps a team of editors either privately or provided through the publish may review the quality of writing; the content of the writing is typically not reviewed by a panel of experts, however. 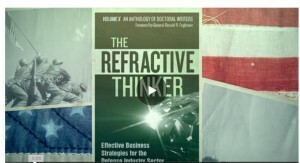 For example, all of my contributions as part of The Refractive Thinker® Doctoral Anthology Series are peer-reviewed. This particular publication is a series (a) just for doctoral scholars AND (b) peer-reviewed by a team of paid reviewers and industry experts. The other books that I have published to include: Journey Outside the Golden Palace, Technology That Tutors, Effective Study Skills in 5 Simple Steps, The Consumer Learner, and So You Think You Can Edit? are all examples of writing written by a doctoral scholar (Me! ), yet they are not peer-reviewed. The easiest example is to discuss the idea of John Creswell. While a wealth of Creswell’s writing include textbooks known by the doctoral student, few universities will allow the use of the textbook in the writing of the dissertation. The solution then? The doctoral student simply must find a peer-reviewed article by Creswell for his work to be considered as part of the 85% requirement. Sarah put down the phone with her mentor, satisfied that she now understood the significant distinction between a work written by a scholar vs. a work written by a scholar that was peer-reviewed. Sarah smiled to herself as she checked one more important detail off her list as she resumed her efforts in writing the literature review of her dissertation.